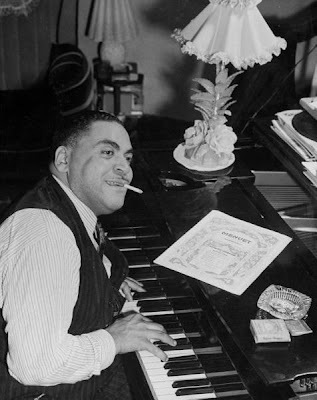 "The Composer Behind the Clown's Greasepaint"
Listen to a tribute to Fats Waller at Dave Radlauer's "Jazz Rhythm." From Time, Aug. 9, 1943: "How Tom is Doin'"
He has cooked up some good ones before. Among them: Ain't Misbehavin', I've Got a Feelin' I'm Fallin', Keepin' Out of Mischief Now. Waller has collaborated with many a lyricist. Some of his best results he turned out with Andy Razaf, his favorite poet next to Longfellow. * During one rewarding session in retreat at Asbury Park, N.J., the two men turned out Zonky, My Fate Is in Your Hands and Honeysuckle Rose in two hours. Razaf had enticed Waller into his mother's Asbury Park home for a productive session away from the nightspots. Says Razaf: "She's a wonderful cook and Fats loves to eat. We had a show to write and I figured that would keep Fats away from the bars. He could set the telephone book to music." Keeping Tom Waller away from bars is a difficult feat. His capacity for both food & drink is vast. A Waller breakfast may include six pork chops. It is when he is seated at the piano that he most relishes a steady supply of gin. When his right-hand man, brother-in-law Louis Rutherford, enters with a tray of glasses, Tom will cry, "Ah, here's the man with the dream wagon! I want it to hit me around my edges and get to every pound." In 1932 Fats balked the depression with a rapid month in Paris. There his enthusiastic friends included Marcel Dupré, onetime organist of Notre Dame Cathedral. With Dupré, Fats climbed into the Notre Dame organ loft where "first he played on the god box, then I played on the god box." In Paris Fats also came into cultural contact with a fellow pianist and expatriate named "Steeplehead" Johnson. Fats got home from the French capital by wiring Irving Berlin for funds. Few who had funds could ever refuse him. With a piano, a bottle of gin, and a hot weather handkerchief, he is one of the most infectious men alive. With his wife Anita and their two musically gifted sons, Maurice, 15, and Ronald, 14, he lives in an eight-room English brick house in St. Albans, L.I. The house has a Hammond organ, a size B Steinway grand and an automatic phonograph with 1,500 records. Next to Lincoln and F.D.R., Fats considers Johann Sebastian Bach the greatest man in history. Once a dewy-eyed young thing stopped Fats and inquired, "Mr. Waller, what is swing?" Said he: "Lady, if you got to ask, you ain't got it." * Razaf's real name: Andrea Razafinkeriefo. He is the nephew of Ranavalona III, last Queen of Madagascar.